WW1 Reenactments Equipment : Great War Tommy WW1 Food Rations Labels : Allies brand Beef Tea Cubes tin, circa 1915. WW1 Reproductions and WW1 Reenactors Equipment / Kit - Allies brand Beef Tea Cubes tin, circa 1915. 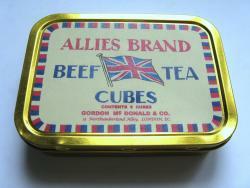 "Allies" brand Beef Tea Cubes tin, circa 1915. 11 x 8 x 2.5cm gilded, sealable tin for Beef Tea Cubes, similar to "OXO" cubes and very popular at the time. Patriotic label by Gordon McDonald & Co of London. Handy for storing tea-bags, small personal kit, etc.